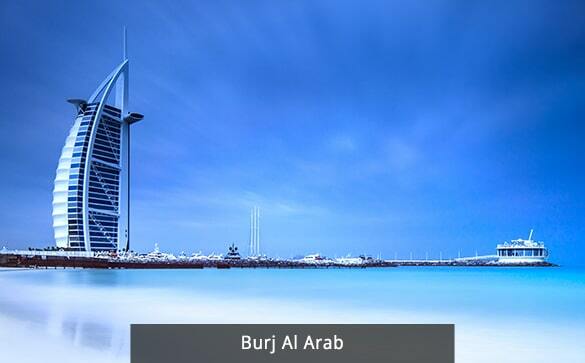 Visit Dubai one of the most cosmopolitan metropolis in the world, your 4 night stay allows you to experience the many attractions and activities that Dubai is famous for; from visiting Burj Khalifa the world's tallest building to enjoying a Desert safari with a BBQ dinner under the stars. 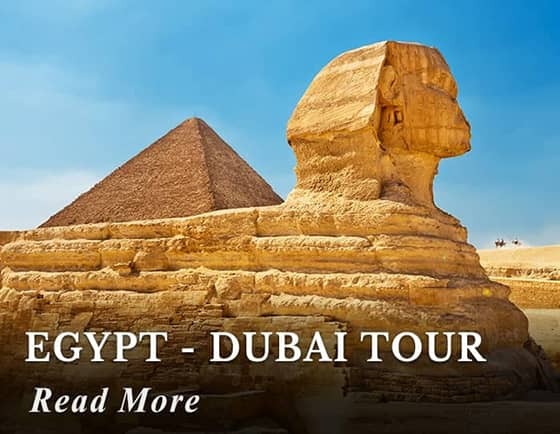 Embark on a six night journey through India, a vibrant and fascinating ancient Country with many landmarks that are a must see. 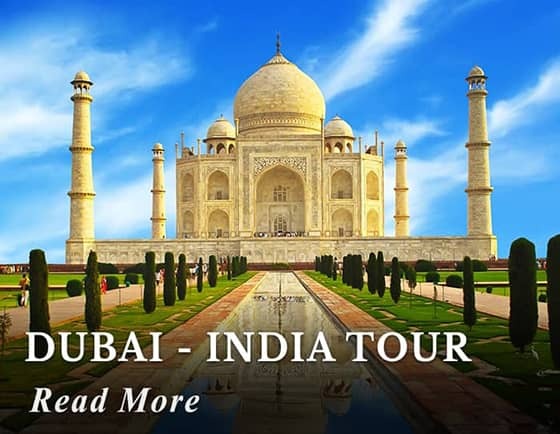 Visit the most well known symbol of India the Taj Mahal, the Mughal City of Fatehpur Sikri, the stately Pink City of Jaipur and tour the Old and New Delhi. 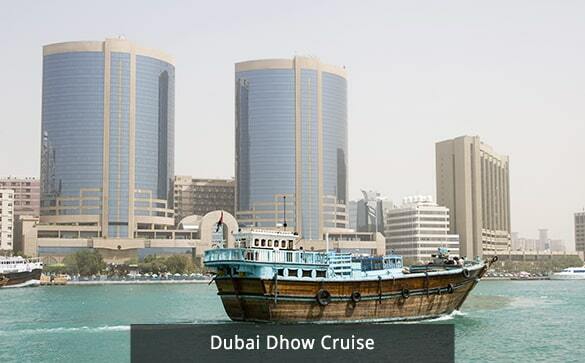 Upgrade at an extra cost to Sheraton Deira Creek or Similar. 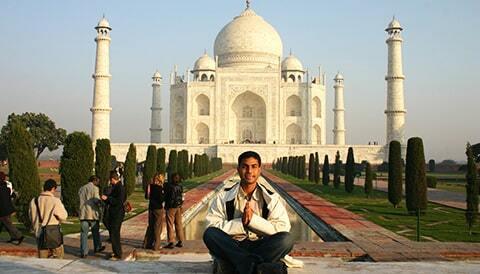 Our representative will assist you with transfer to board your flight to New Delhi. Arrival in New Delhi. Welcome to the Indian Capital New Delhi, full of historical treasures and no shortage of things to do, prepare yourself to be amazed by this international metropolis home to 17 million people. American and Canadian Passport Holders need a Tourist Visa to enter India; visa to be obtained on line prior to departure. Proceed to clear customs and immigration. American and Canadian Passport Holders need a Tourist Visa to enter India; visa to be obtained on line prior to departure. 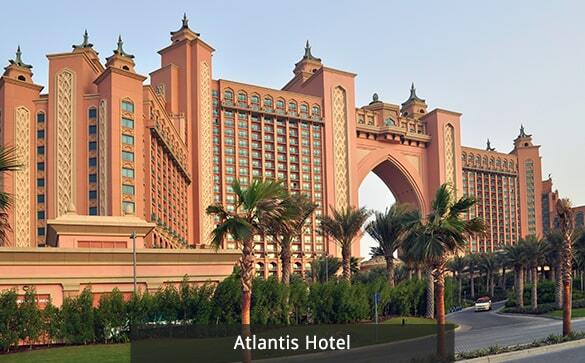 Continue to the exit, where you will be assisted by our Representative with transfer to your Hotel. 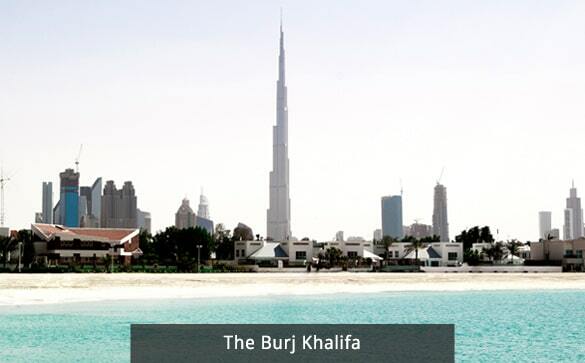 Accommodation: The Suryaa Hotel or Similar. Qutab Humayun's Tomb: Humayun's tomb is the tomb of the Mughal Emperor Humayun. The tomb was commissioned by Humayun's wife Hamida Banu Begum in 1562 CE, and designed by Mirak Mirza Ghiyath, a Persian architect. It was the first garden-tomb on the Indian subcontinent. It was also the first structure to use red sandstone at such a scale. The tomb was declared a UNESCO World Heritage Site in 1993 and since then has undergone extensive restoration work, which is still underway. 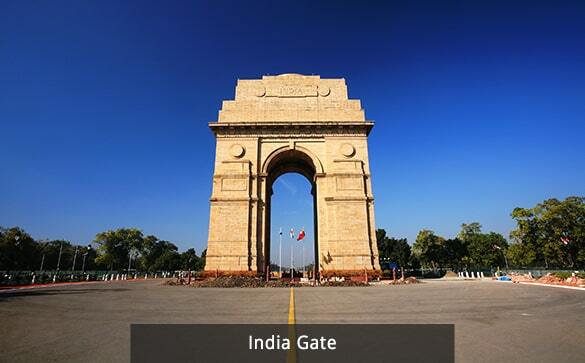 Drive past the India Gate: In the heart of New Delhi built to commemorate the Indian soldiers who lost their lives in World War I fighting with the British army. You will also see the War Memorial, Presidential Palace, and Government Buildings. Rickshaw Ride: down through Chandni Chowk, the old marketplace of Shah Jahanabad and now a picturesque bazaar. 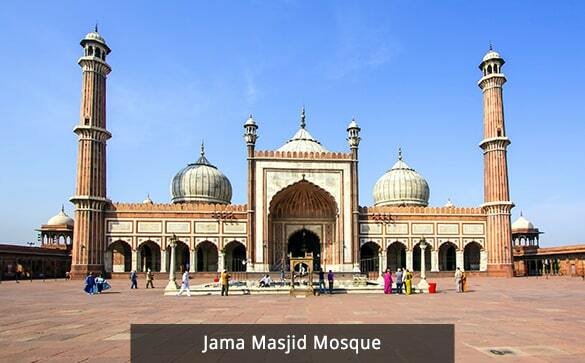 Jama Masjid Mosque: The largest in India, built by Mughal Shah Jahn, who also built the Taj Mahal and the Red Fort. Later your Guide will drive you two hours along the new Taj Express Way to the City of Agra Capital of the Mughal Empire. Upon arrival your guide will check you in at your Agra Hotel. Accommodation: Ramada Plaza Agra Hotel or Similar. Activities included today: City Tour of the Old and New Delhi. Travel by road from Delhi to Agra. Taj Mahal: One of the Wonders of the World, built in 1653 of white marble by Emperor Shah Jahan in memory of his beloved wife Mumtaz Mahal. 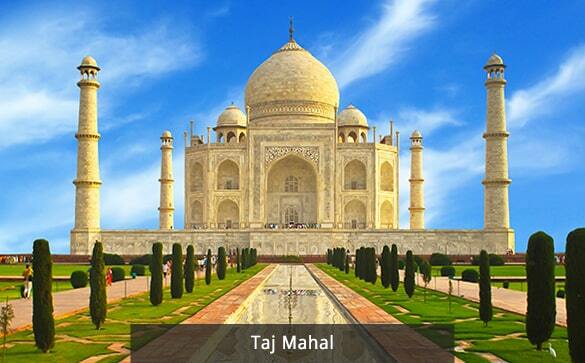 This enchanting Tomb Mausoleum is one of the World's most admired romantic Monuments of India's Mughal era. 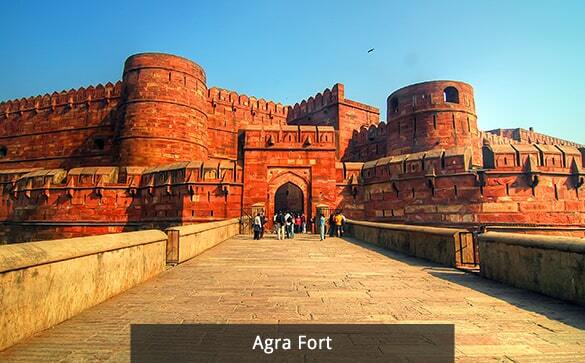 Agra Fort: Built in 1565 this impressive Fort has 2.5 km long of enclosure walls, inside two beautiful Mosques made of white Marble the Pearl Mosque and the Nagina Masjid, they are other Palaces as well. Imprisoned by his son within the walls of the Fort, Emperor Shah Jahan had a view of this beloved wife's Mausoleum from a balcony in the Musamman Burj Tower till the time of his dead. Itmad Ud Daulah's Tomb: Nicknamed as Baby Taj, this was the first Mughal structure built completely from marble. Built between 1622 and 1628, this is the tomb of Mirza Ghiyas Beg, chief minister of Emperor Jehangir and father of Nur Jahan. 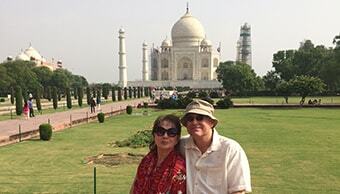 Activities included today: Visits to the Taj Mahal, Agra Fort and Itmad ud Daulah's Tomb. Fatehpur Sikri: An Unesco World Heritage Site, originally the City's name was Sikrigarh, named Fateh (Victory) after being taken over by Emperor Akbar in the second half of the 16th Century. It is a complex of Royal Palaces, courtyards Mosques and various buildings, this complex is one of the best preserved examples of Mughal architecture in India. Within its walls is the Jama Masjid Mosque one of the largest in India. Upon arrival in Jaipur, the Guide will assist you with check in at your Hotel, we use 4* Four Points by Sheraton, located in the heart of Jaipur, 114 rooms within close distance from most popular tourist attractions. Breakfast is included. Accommodation: Ramada Jaipur Hotel or Similar. 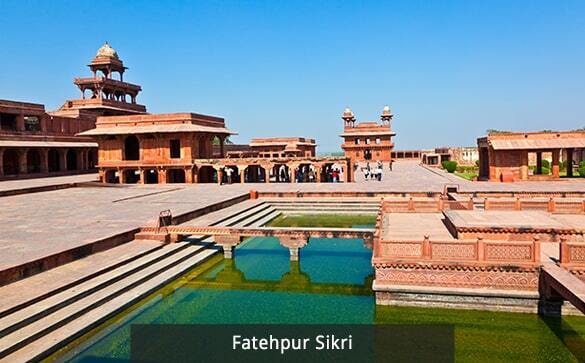 Activities included today: Travel by road from Agra to Jaipur, en route stop for a visit to Fatehpur Sikri. 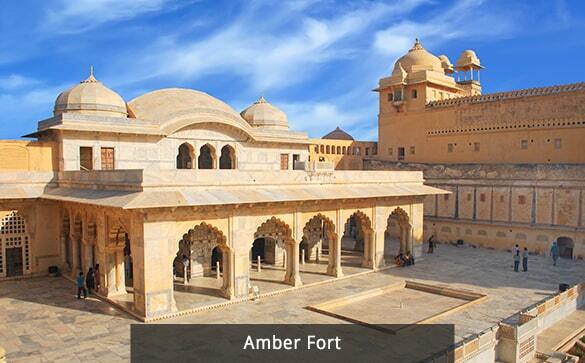 Amber Fort: Travel by elephant up to Hill where is located. Built in 1592 by Maharaja Raju Man Singh is one of the most popular attractions in Jaipur, a beautiful Palace Complex of red sandstone and marble that combines Hindu and Rajput features. Hawa Mahal: This Palace is a magnificent sample of Rajput architecture built for the ladies of the Royal Palace, hence its latticed windows they could see out but no one could see them. City Palace: Built in the 19th century is an imposing Palace a combination of Mughal and Rajput style, it was constructed in the heart of the City by Maharaj Sawai Jai Singh, most of the Palace is a Museum hosting a very interesting collection of weapons, and royal customs. Jantar Mantar: Most likely this site is something you do not expect to find on your tour, an astronomical observatory, built in the early 18th century is a collection of instruments built on the ground, here you find an equinoctial sundial, various other sundials, meridian and hemispherical measuring instruments, and others that measure celestial latitudes and longitudes to name a few. 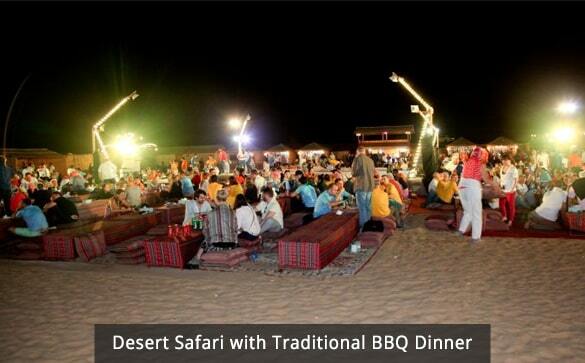 Enjoy a Dinner with Rajasthani Music and Dance at the Narain Niwas Palace. 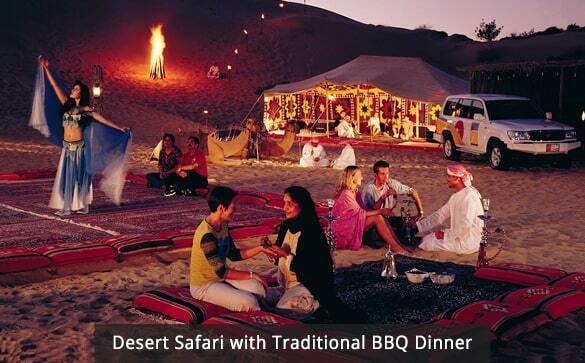 A Great opportunity to experience the Rajput Royalty with Rajasthani Culture. 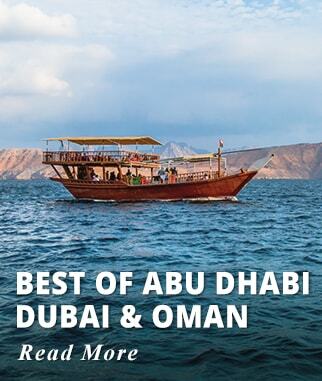 $49 USD per person. Includes transfers. No drinks included. 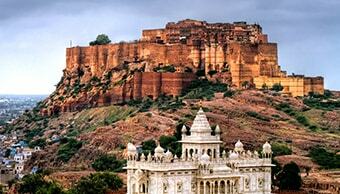 Activities included today: Visits to: Amber Fort, Hawa Mahal, City Palace and Jantar Mantar. After breakfast our representative will drive you back to Delhi. Check in at your Delhi Hotel. Rest of the day at leisure. Accommodation: The Suryaa Hoel or Similar. Activities included today: Travel by road from Jaipur to Delhi. Rest of the day at leisure. Our representative will assist you with your arrangements for your return. 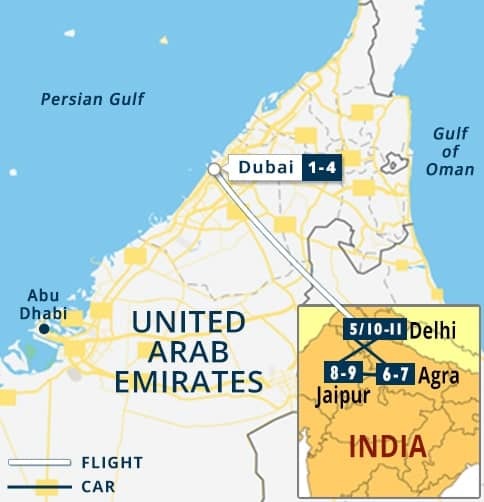 International Flights, including flight Dubai - Delhi we offer departures from most major cities in the USA and Canada. Two nights of accommodation in Delhi, at The Suryaa Hotel or Similar. Two nights of accommodation in Agra, at the Ramada Plaza Agra Hotel or Similar. Two nights of accommodation in Jaipur, at the Jaipur Hotel or Similar. Burj Khalifa 124th floor entrance tickets non-peak hours. Non-prime hours are, 08h30 to 15h30 & 18h30 until closing. Rickshaw Ride in Old Delhi Market. Visit Itmad Ud Daulah's Tomb. Elephant Ride in Jaipur's Amber Fort (subject to local operation). 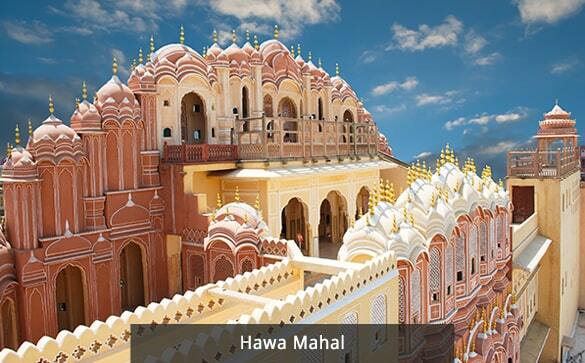 Visit the Hawa Mahal known as the Palace of Winds Jaipur. Visit The Maharaja's City Palace Jaipur. 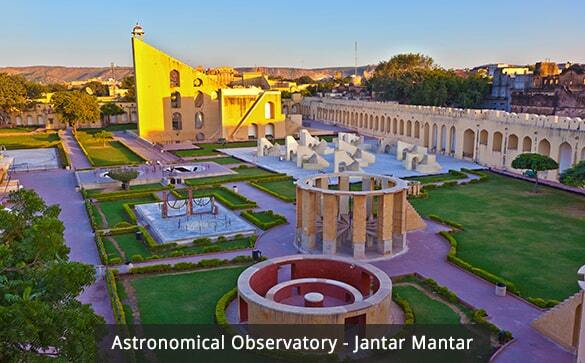 Visit Jantar Mantar Jaipur's open air astronomical observatory. All entrance fees during sightseeing. 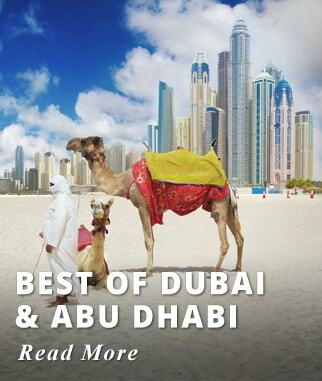 All applicable taxes (except Dubai's Hotel local tax). 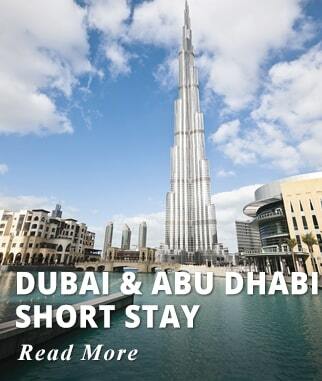 Dubai Tourist Fee of 15 Dirham per room per night (approximately USD 5 per night).